September was my birthday month and the beginning of fall! 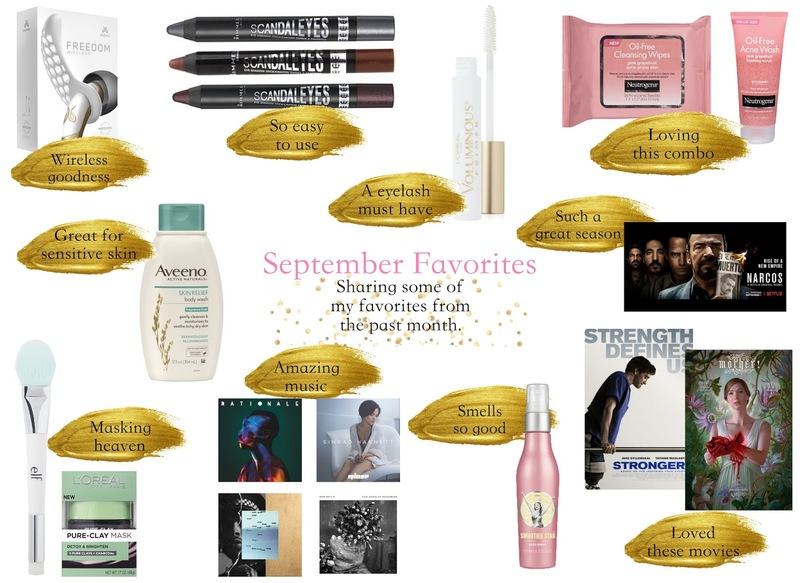 Check the makeup, skincare, tech, music, movies, and television favorites that made my birthday month so much better. I've been loving this combo over the past month. The cleansing wipes do a great of job taking off all my makeup without leaving my face super dry. The foaming scrub is contains microbeads that gently exfoliate the skin, the cleanser helps get rid of any breakouts I have and leaves my face soft. I was looking for a simple body spray that I could throw in my bag and use when ever I felt I needed it. I came across the Soap & Glory smoothie star body spray on a weekly trip to Target. The smoothie star spray has warm notes of sweet almond and creamy vanilla with base notes of sandalwood and musk. This spray is great if you need a quick fragrance pick me up, unfortunately the smell of fragrance does not last long. You cant rely on it to be your daily fragrance that last all day. Despite this I still think its a great buy for the price. I'm always looking for easier ways to apply my makeup. These shadow sticks from Rimmel are amazing, they are have great pigmentation, are easy to use, and are inexpensive. I simply apply the shadow stick color to my lids and use my fingers or a brush to blend it out. I'm obsessed with masking, so when I saw this E.L.F brush for masking I had to have it. The brush helps me evenly apply my mask, without all the mess I usually get when I use my fingers. I also love this L'Oreal Paris clay mask, the mask is super creamy and gives your face a tingling sensation after your apply it. I use the mask brush to apply it to my face, I leave it on for 10 or so minutes, and after I wash it off my face is left velvety soft and supple. This fragrance free body wash from Aveeno has done wonders for my sensitive skin. Heavily fragranced body washes tend to dry me out really easily. A little goes a long way with this body wash and it leaves my skin clean and smooth. I'm a true believer in the virtues of a eyelash primer, before my conversion I never saw the need for it. Now I can't apply mascara without applying a lash primer first. I have short stubby eyelashes so I need all the help I can get to lengthen and volumize them. I love that the primer helps separate and define my lashes so that when I apply my mascara I get the false eyelash look. Rationale's new single Into the Blue comes before the release of his self titled debut album. I have featured Rationale on my monthly favorites over and over again, his music is so amazing! I've been listening to Into the Blue on constant repeat, I can't wait for the new album. In one week Miguel surprised us with two new songs, Sky Walker and Shockandawe. I loveeee Miguel so anytime I see new music released by him I have to take a listen. Of the two new songs, Shockandawe is my absolute favorite. I like how different this song feels compared to his 2015 album Wild Heart. I can't wait to hear more from him! Stronger starring Jake Gyllenhaal and Tatiana Maslany, is true story about Jeff Bauman who lost both of his legs during the Boston Marathon bombings in 2013. Gyllenhaal and Maslany are amazing in this movie, they do a great job showing the raw emotion and struggle that surrounded these two people during such an traumatic event. Full review coming soon! Darren Aronofsky wrote and directed this "psychological thriller" about a relationship between a couple, played my Jennifer Lawrence & Javier Bardem, whose relationship is tested when uninvited guest come to their house. If you watched Mother! you either hated or loved it, I'm in the later branch and I'll explain why in my full review coming soon 😜. I've enjoyed every season of Narcos, season 2 ended with the death of Pablo Escobar and the rise of the Cali cartel. I really enjoyed the change of pace and characters for season 3. Because Narcos is so fascinating and shocking the show is a super easy binge. Watch all 3 seasons of Narcos on Netflix.